An authentic Mississippi Delta “juke joint” where the world-famous original Bentonia Blues was born and can still be heard. 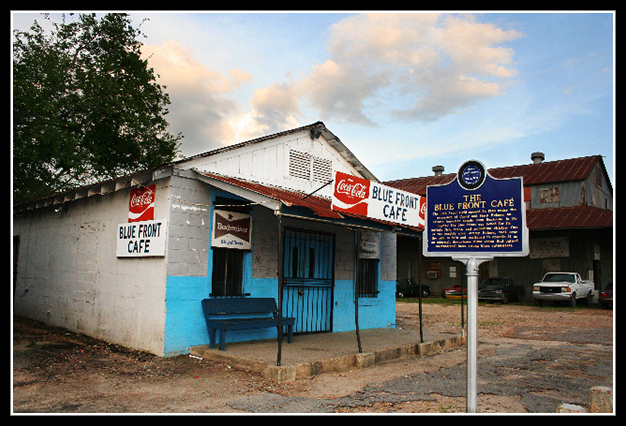 The Blue Front Cafe is considered the oldest active juke joint in Mississippi. The Blue Front Café opened in 1948 under the ownership of Carey and Mary Holmes, an African American couple from Bentonia. In its heyday the Blue Front was famed for its buffalo fish, blues, and moonshine whiskey. One of the couple’s sons, Jimmy Holmes took over the Café in 1970. I will visiting the area from Canada the week of Oct 10th…..looking forward to an authentic juke joint experience heh! Hello, Suzette! Thanks so much for your message. The Cafe is usually open on the weekends, except for when Mr. Holmes is traveling for performances. The Cafe does not sell food usually. During special events there may be food vendors, but otherwise you can get a cold pop or beer at the Cafe. For additional information, or to check on scheduling your visit, please call Jimmy “Duck” Holmes at 662-528-1900. Does the Blue Front Cafe have live music only certain nights of the week (e.g. Fri and Sat)? Thanks for your question, Franke. The Blue Front Cafe is a real-deal authentic juke joint… that means outside of scheduled events you never really know what you’ll find to be happening. The juke is usually open almost every day. You can find the Blue Front Cafe page on Facebook to keep up with scheduled events.